Feeling nervous, restless or too stressed to sleep? 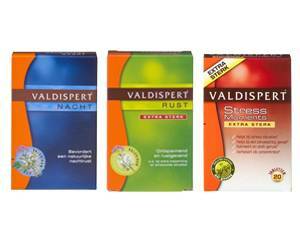 Valdispert is a natural, herbal remedy that helps you to relax. Valdispert has been known as a natural sedative for many years. This herbal preparation is perfectly safe to use, long term if necessary. Valdispert is available in various forms and for every situation. Order Valdispert online quickly and safely from one of Dokteronline.com’s partner pharmacies. Speaking in front of a large audience, waiting for exam results, your driving test... These are all situations that can be quite stressful. Sometimes that stress can be so severe that you experience an emotional or physical reaction which may manifest itself as nervousness, nausea, lack of appetite, tremors or restless sleep. Valdispert contains valerian and other natural, soothing plant extracts that help calm nerves and relieve other symptoms. Because nervousness and restlessness may have many different origins, Valdispert offers a wide range of herbal preparations with different orientation. These formulas are tailored to your specific needs to ensure your symptoms are addressed effectively. Valdispert is not habit forming and has no side effects. Valdispert reduces restlessness and nervousness naturally. Valdispert Stress Moments: valerian root extract with lemon balm. Has a soothing and calming effect, and can be used in various stressful situations and for inner restlessness. Dosage: one tablet at the onset of stress (with a maximum of three tablets a day). Valdispert Night: contains hops and valerian. Helps ease you into a peaceful, stress-free sleep. Dosage: two to three tablets, one hour before bedtime. Valdispert Night Extra Strong: contains passion flower, melatonin and valerian. Supports a natural sleep-wake cycle and promotes sleep. Dosage: one coated tablet, two hours before bedtime. Valdispert Calm: classic Valdispert formula. Has a calming effect in stressful situations and promotes concentration. Dosage: one to three coated tablets, three times a day. Valdispert Rest Extra Strong: extra strong sedative. Helps with stressful situations and mental exertion. Dosage: two coated tablets, three times a day. Valdispert Kids Rest: pleasant orange-flavoured syrup with valerian, passion flower, camomile and California poppy. Calms during the daytime and helps maintain a natural, relaxing sleep at night. Suitable for children of 12 months and older. Dosage: 5 ml two to three times a day for restlessness during the day. 10 to 20 ml (depending on age) one hour before bedtime for a healthy night’s rest. Read the package leaflet before you start using Valdispert for precise dosage instructions. Valdispert is a natural product. This makes side effects unlikely. If side effects do occur, consult a doctor. Do not use if you are allergic to any of the ingredients in Valdispert (see the package leaflet or information on the package). Valdispert’s regular line is not suitable for children under 12 years of age. The products from the Valdispert Kids line are suitable for young children. Do not use Valdispert if you are pregnant or breastfeeding without consulting a doctor first.